"My father's greatest living heroes were John Glenn and Jim Whittaker--a physical giant with a huge heart, a decent soul, and inspirational courage. We can all be grateful that Whittaker has finally put his extraordinary life on paper. Whittaker's story is a riveting saga of high adventure by one of history's greatest climbers." --Robert F. Kennedy, Jr. In May of 1963 Seattle mountaineer Jim Whittaker stepped into world history by becoming the first American to summit Mount Everest. Fifty years later, he is still regarded as a seminal figure in North American mountaineering, as well as an astute businessman who helped create the outdoor recreation industry. 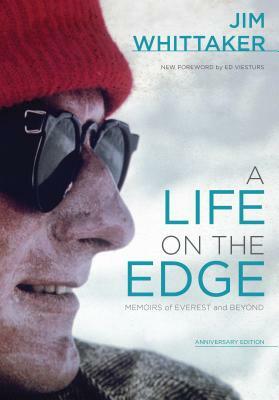 A Life on the Edge: Memoirs of Everest and Beyond is Jim's courageous, no-punches-pulled autobiography and a look at a peripatetic, sometimes difficult life. Beyond the glory of the Everest summit and his other extraordinary climbing feats, including the first American summit of K2, he openly describes his personal, "everyman" experience of social upheaval in the 1960s and 70s, an early divorce, family strife, a passionate new love later in life, near-bankruptcy, and business triumphs and losses. Jim tells it all with verve and honesty and, true to his nature, turns every setback into the stage for new adventure. This special 50th anniversary edition celebrates the story of Jim's life and features a new foreword by Ed Viesturs, as well as a new final chapter that brings readers up-to-date, including details of his trek to Everest Base Camp in 2012 and his son Leif's recent successful summits of Everest. Need more Jim Whittaker? Checkout his interview on New Day Northwest as he talks about Everest, training, and the shocking differences between climbing Everest 50 years ago versus today. This title is part of our LEGENDS AND LORE series. Click here > to learn more.